Nintendo started their long path into technology-driven consumer entertainment in 1973 with the opening of the first light-gun shooting range. The venture was a success, and over the next few years Nintendo worked on a number of arcade light-gun games as well as home consumer electronics (the Color TV Game systems). 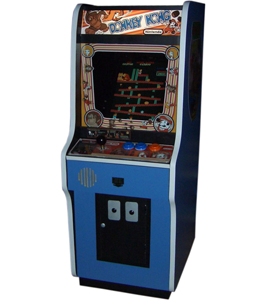 Nintendo released their first sprite-based arcade game in 1978, but they didn't see major gains from the medium until 1981 with the release of Donkey Kong. The game changed Nintendo's fortunes drastically, giving the company a foot into the US market as well as a selection of marketable characters. With the success of their home consoles and handhelds, Nintendo has released no more than a handful of arcade games since 1990. 1986 VS. Super Mario Bros.